The Freightliner EconicSD comes standard with Detroit Assurance suite of safety systems, which includes side guard assist. Side guard assist utilizes radars to sense objects on the side of the truck and alerts the driver. 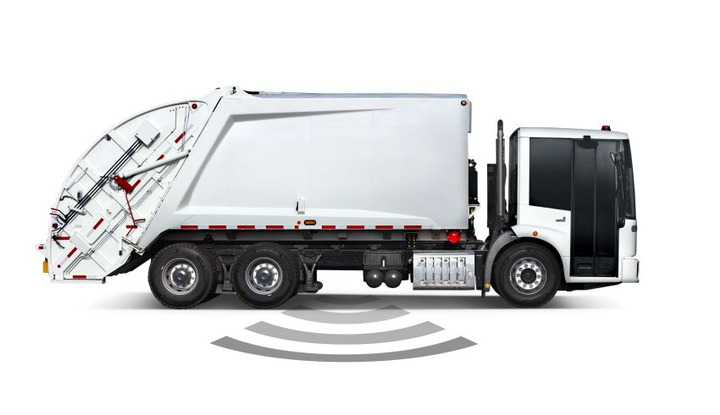 The Freightliner EconicSD waste collection truck is a modern, innovative solution for the refuse segment. Noting a first for the brand’s vocational lineup, the Freightliner EconicSD comes standard with the Detroit Assurance suite of safety systems, which includes active brake assist, adaptive cruise control, lane departure warning, and side guard assist. The vehicle’s expansive windshield and mirror system both reduce blind spots and provide panoramic views for better visibility at every turn. When combined with the truck’s lower seat orientation, drivers have clear views of their surroundings. The Freightliner EconicSD’s low-entry concept – which includes an optional kneeling function on front axles – makes getting in and out of the cab safer and easier. A low step-in height of only 19-inches and a low floor height with through-cab access is easier for both drivers and passengers. Additional options include a pneumatic bi-fold door with full-length tinted glass on the passenger’s side and an optional built-in camera system with blind spot views. Inside the cab, a suspended driver’s seat features multi-axis adjustment and heating capability for comfort. Adding to the driver’s experience, the vehicle’s wheel cut provides enhances maneuverability, making it great for urban and neighborhood environments.